Coastguard Boating Education’s new general manager, Mike Brown, wants to target groups that don’t usually sit CBE courses and who are often over-represented in boating statistics. Mike Brown, who has an extensive background in both outdoor activities and education, is also determined to accelerate CBE’s move into offering courses on line. He says CBE’s new VHF Online radio operator’s course is a great example. Due for imminent release, it teaches the relevant rules and allows people to practise making a variety of calls including trip reports, MayDay and Pan Pan calls before they sit the test. A published author with a PhD in Education Mike Brown’s varied career includes sail training for young people and stints as the operations manager at Yachting NZ, as an instructor and duty manager at Outward Bound, as a CBE examiner and working in tertiary education. 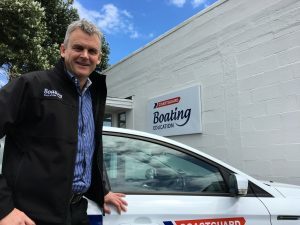 “I am passionate about education and the maritime environment — and about helping save lives at sea as the general manager of Coastguard Boating Education,” he says.